Here is my entry for this weeks sketch Saturday challenge. I've used one of my gurjuss girls coloured with my prisma's, boy these take some getting used to this is the first one that I'm happy with but i know i have a long way to go yet, will have to keep at it. 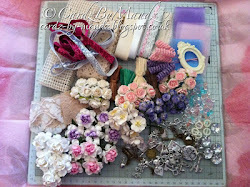 Patsi has said she is going to give me a few tips when i go to the craft meet in Warrington in May. It's only right really since it's her fault i bought them(like i needed my arm twisted)in the first place. 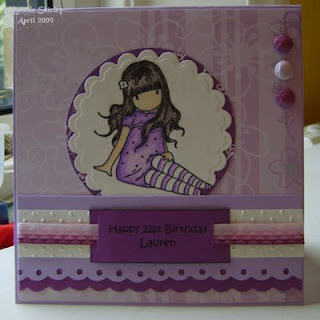 Papers are from my stash and the little brad like things are card candy that i got from Aintree on Saturday can see me using loads of these i love them. Such a sweet card Shell. I think your colouring is spot on. i love your interpretation of the sketch.